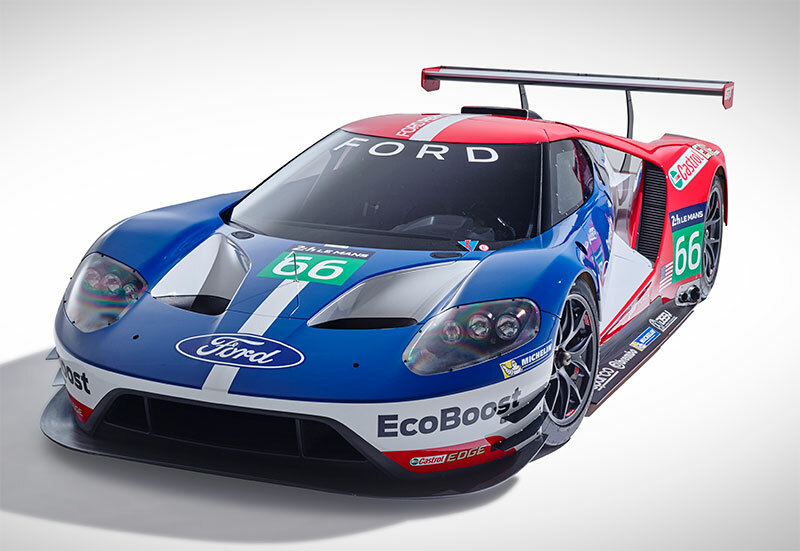 June 12, 2015 – Le Mans, France – Today Ford announced that they will be returning to one of the most prestigious automobile races in the world with its new Ford GT race car. The Ford GT race car will compete in the 24 Hours of Le Mans next June in the Le Mans GT Endurance class, for professional teams and drivers (LM GTE Pro). The race car is based on the all-new ultra-high-performance Ford GT supercar that was unveiled to the public for the first time in January of this year. Both the production car and race car will arrive in 2016 to mark the 50th anniversary of Ford GT race cars placing 1-2-3 at the 1966 24 Hours of Le Mans. Ford went on to repeat its victory at Le Mans in 1967, 1968 and 1969. The new Ford GT race car will run the full 2016 season schedules of the FIA World Endurance Championship and TUDOR United SportsCar Championship. It will be making its competition debut in January 2016 at the Rolex 24 At Daytona. The two Ford teams will be operated by Chip Ganassi Racing with Felix Sabates (CGRFS). Both teams intend to compete with a four-car effort at Le Mans – drivers will be announced later. Besides great success in sports cars, Ganassi race teams have achieved major victories in the Daytona 500, Brickyard 400 and the Indianapolis 500. The all-new Ford GT serves as the pinnacle product of the new Ford Performance group, a division dedicated to providing innovation through performance. Expecting to deliver more than 12 new performance vehicles by 2020, Ford Performance will leverage its racing efforts and expertise to speed innovations on dedicated performance models and performance parts – in order to quickly iterate the latest technologies that can ultimately be applied to the entire Ford vehicle lineup. The performance segment is a growing business for Ford, as the company recognizes its customers’ desire for vehicles that offer a combination of excellent fuel economy, leading technology and a great driving experience. The Ford Performance lineup includes: Ford GT, Focus RS, F-150 Raptor, Focus ST, Fiesta ST, Shelby GT350 and Shelby GT350R. 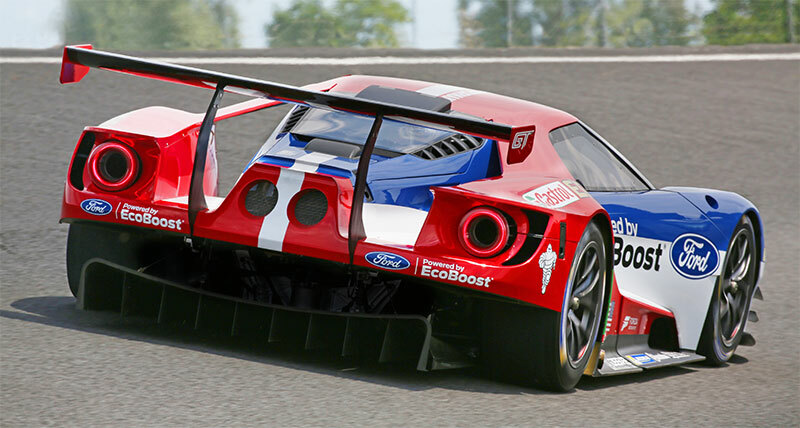 “As we developed the Ford GT, from the outset, we wanted to ensure we had a car that has what it takes to return Ford to the world of GT racing…that can once again compete on a global stage.” said Raj Nair, Ford Motor Company group vice president, Global Product Development and chief technical officer. The 3.5-liter EcoBoost V6 engine debuted in the TUDOR United SportsCar Championship in 2014 and since then has captured significant overall wins at the 12 Hours of Sebring and Rolex 24 At Daytona. Joining Ford in this project are Multimatic Motorsports, Roush Yates Engines, Castrol, Michelin, Forza Motorsport, Sparco, Brembo and CGRFS. The race car has undergone extensive design and testing within Ford and Multimatic, with CGRFS providing input into the development. Roush Yates is supporting development of the 3.5-liter EcoBoost V6 – the most powerful EcoBoost production engine ever.